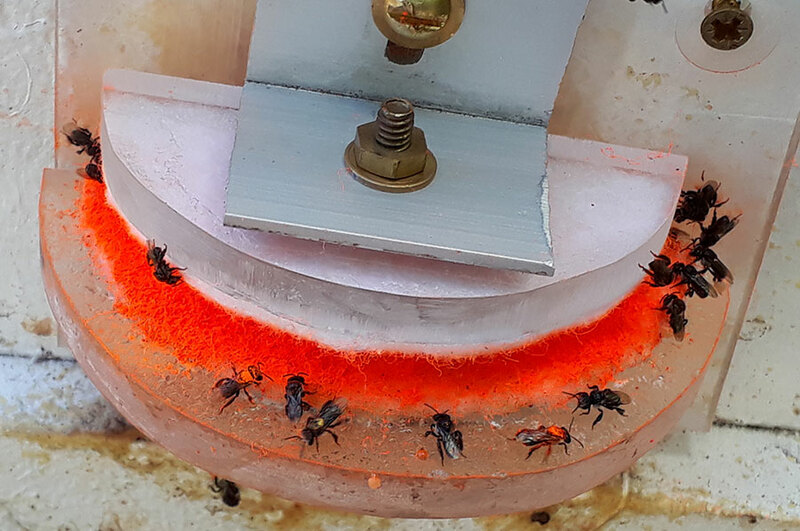 Researchers at Western Sydney University are using fluorescent orange and green dye powders to mark the movements of insect pollinators in enclosed glasshouses to determine whether Australian native bees are effective at pollinating fully-enclosed crops. The researchers apply dye powders that glow under ultraviolet light and can be used to visualise the paths that bees take when they visit flowers on glasshouse crops such as eggplants. The Healthy Bees pollination research aims to provide insights to industry and science on the roles that a diverse range of pollinators play in visiting flowers, consuming nectar and moving pollen between flowers. The research takes in long-term field and glasshouse experiments in fruit and vegetable crops and native ecosystems. “Early indications reveal that stingless bees are able to cope well with the glasshouse environment as long as they have supplementary food and water,” explains Associate Professor Robert Spooner-Hart (opens in a new window), program manager for the glasshouse pollination program based at Western Sydney University’s Hawkesbury Institute for the Environment. “The fluorescent dye acts like pollen by coating the bees’ bodies and is left behind on the flowers wherever the bees land,” he said. This is a technique for stingless bees developed by Samantha Redshaw from the University of Queensland. The ‘Stingless Bees as Effective Managed Pollinators for Australian Horticulture’ project is part of an effort to enhance crop pollination inside protected environments such as glasshouses, polytunnels and other cropping structures. Honeybees are often poorly-suited to pollinating glasshouse crops because of the way they pollinate and the risks to workers from stings. The researchers are trialling the use of stingless bees (Tetragonula carbonaria) inside Western Sydney University’s National Vegetable Protected Cropping Centre at the Hawkesbury campus. The project has seen the installation of colonies of native bees that acclimatise to the glasshouse environment before crops are planted. When the crops flower, the native bees are ready to visit the flowers and their ability to move pollen inside the glasshouse can be evaluated using special ultraviolet torches and dye dusts that are similar to pollen. The pollination research program is a multi-million dollar investment that aims to strengthen the resilience of fruit and vegetable production by safeguarding essential pollinators. Lead Scientist of the Healthy Bees pollination program, Professor James Cook (opens in a new window) explains that honeybees are just one of many essential pollinating organisms. “We have more than 2000 species of native bees in Australia, as well as moths, butterflies, mammals and birds that contribute to plant pollination. The worldwide threats to European honeybees from colony collapse, loss of habitat and climatic changes mean that we need much more knowledge about which organisms visit flowers, which ones move pollen around and which ones actually do the important work of pollination”, James said.